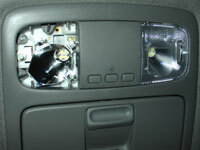 This page details the upgrading of my Toyota 4Runner's interior courtesy lighting from standard automotive incandescent light bulbs to Led (light emitting diode) type lighting. 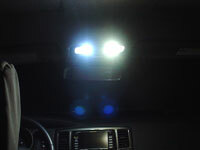 This was done primarily to significantly increase overall nighttime visibility and secondarily to change the color of the warm yellowish factory incandescent filament light bulbs cast to a whiter, cooler color range. 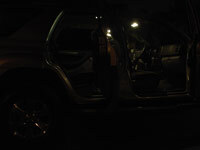 This modification was done in conjunction with two other mods, the Maplight Mod and the Footwell Light Mod, and when all three are completed the results are a drastic improvement over the factory courtesy lighting setup. 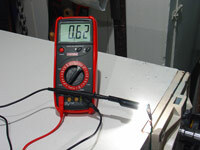 The results are brighter light output, better color, a reduction of dark shadowed areas, and lower power consumption. This is my second iteration of modifying the interior lighting on this vehicle. My first version was a complete changeover to 6000k leds. 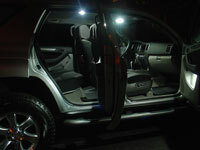 See that write up archived here...6000k 4Runner Interior LEDs. While the 6000k color was a vast improvement over the factory lighting, my original preference was for something with no hint of blue in it. 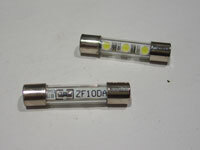 I went with VLeds.com originally but they did not have a complete offering in 5000k color at that time. Now they do. I had the 6000k bulbs installed for 1.5 years with absolutley no issues or problems at all. Due to the great experience with VLeds, I went with them again for the change to 5000k. 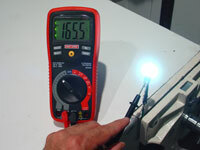 For those who do prefer the 6000k HID color, all the bulbs listed on this page are available in the 6000k color as well. 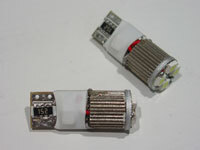 Please note, while many of the bulbs listed on my 6000k interior led page have been discontinued, you can still refer to the photos on that page for the color differences. The meter being used in these tests is a Craftsman #82334 Autoranging, 11 Function Digital Multimeter. 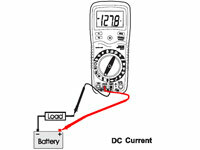 It is accurate to 0.5% when reading DC voltage and 1.5% to 2.5% when reading DC current. As you know from reading above, I have used VLeds for my interior lighting previously. I have ran one of their 6 Led high power M-SMT bulbs in the 6000k color for over a year and can attest that 120 lumens is perfect for the 4Runner domes. They are very bright, but not so bright that is is going to look overdone. I am not looking for the brightest leds out there. 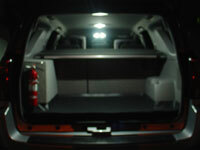 Having the brightest dome light may be great for someone who is not doing the Maplight and Footwell mods. But I am looking to have an overall uniform and consistently lit interior, hence the choice of a moderate lumen levels from more lighted areas. 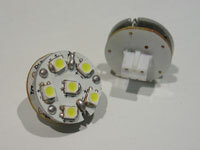 Installing the V-Leds 6-Led board is simple. First, use a small flathead screwdriver to gently pry off the dome lens. 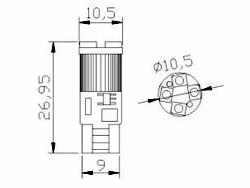 There are two small indentations on one side of the lens where the screwdriver can be inserted, and thet is where you pry from. 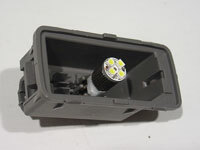 The VLed bulb is available with various different socket adapters and the DE3175 (DIY_BASE_3175) adapter fits perfectly in the 4Runner dome lamp housing. 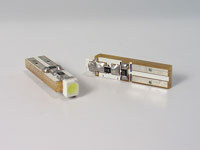 The Led circuit board snaps right into the socket adapter. 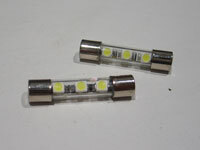 There is just enough clearance between the installed led circuit board and adapter assembley and the installed dome light lens to avoid the two touching. 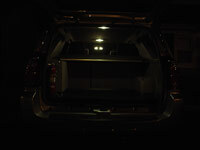 I have tested the leds by leaving them on for the full 30 minutes it takes the 4Runner to activate the automatic dome relay power off feature. After the 30 minute period, the lens was indeed warm to the touch but there was no heat related damage inflicted whatsoever. The light output of these very small boards is nothing short of amazing. The 5,000k color temperature is just what I've been waiting for as well. 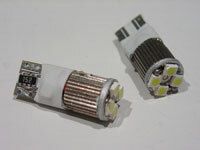 Choosing the maplight Led replacement bulbs required particular consideration. First of all, due to performing the maplight mod, these lights will now automatically turn on with every instance of entering and exiting the vehicle. 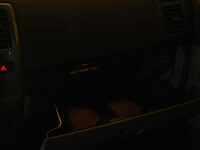 For consistency, their light color and brightness would need to match that of the dome lights since they will be in operation at the same time. Fortunately, all of the V-Leds.com interior led replacement bulbs I have purchased were available in the same 5,000k Kelvin color. So sticking with one supplier for all the replacement lights for this project is a given. 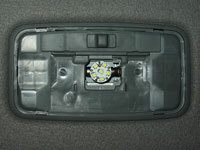 In terms of the maplights brightness, I was looking for them to match the dome lights 120 lumens. 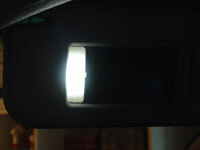 Since there are two maplights, 60 lumens each would be ideal. 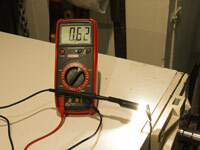 These bulbs run at 80 lumens each and that was the closest lumen level in 5k color I could get. 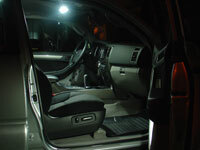 I specifically chose a down firing only Led bulb, rather than one with radial (side mounted) firing Leds, to reduce any glare that may affect the drivers night time vision when used as a traditional maplight in complete darkness while driving. The integrated aluminum heatsink is a nice touch to have on high power led lights that may be on for extended periods as well. Installation begins with the maplight lens removal. Use a small flatheat screwdriver to pry out the lens beginning with the inner most facing part of the lens and after you get that freed, pry out the outer section. 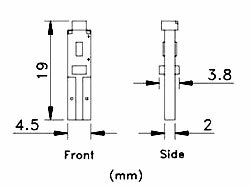 There are four clips built into the lens that hold it in place. Be careful not to snap them off. 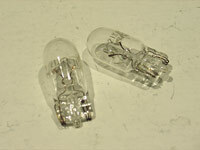 Since this is a wedge type replacement bulb, installation is basically no different than with a standard incandescent factory bulb. But keep the following in mind. 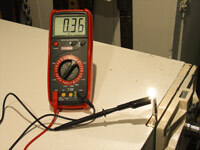 Leds, as well as all diodes, are polarity sensitive. 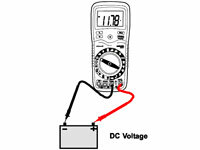 This means that the positive and negative terminals must be connected correctly for it to operate properly. 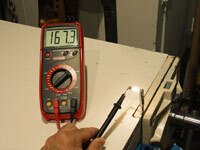 If upon installation they don't work, reverse the orientation (polarity) of the bulb. The factory door lights put out virtually no light at all onto the ground. 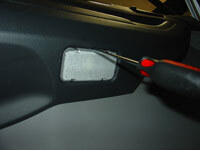 They are basically there as marker lights to warn oncoming vehicles your door is open. 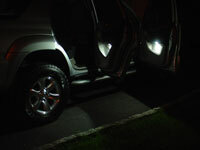 I intended to find a high power wedge replacement Led that would put out much more light and hopefully act as puddle type lamps if at all possible, lighting up the ground in the area of entering and exiting the vehicle. Their position and aiming is not perfectly suited for this usage but that was the hope at least. 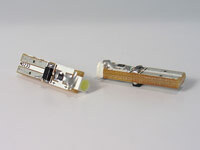 There is no reflector inside the door light housings and a down firing only type Led would again be the best choice here. 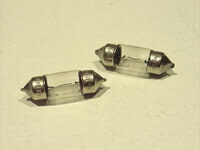 I went with V-Leds second highest power offering in the wedge base #194 surface mount technology (SMT) type bulb...194_4_RB_W_5K their 2watt, 80 lumen down firing wedge base bulb. 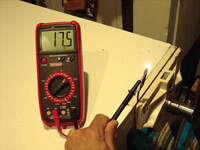 Their highest power down firing 194 bulb is the ones I am using in the domes. 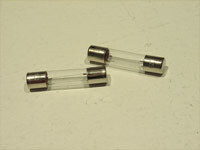 I chose the ones I went with primarily because they have an aluminum heatsink built right into the bulb. 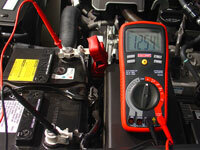 There are many times when the interior lights of the vehicle may stay on for extended periods of time. For example, when working on an extensive mod that may require the opening and shutting of the doors multiple times, which will reset the automatic dome relay power off feature. This feature would typically shut these door lights off after being left on for 30 minutes. But opening and closing the door resets it. While you can switch off the door operation of the domes, maplights (via the J.A. 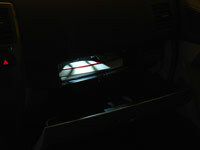 maplight mod), and footwell lights (via the J.A. 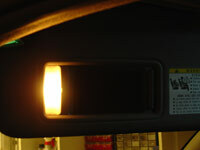 footwell mod), there is no such way to turn off the door lights short of pulling the fuse. For these times, which are not as rare as you may initially think, it is nice to have the integrated heatsink feature. I ordered four of these bulbs, one for each door and am very satisfied with the choice. 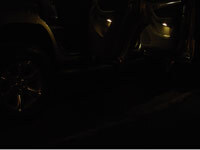 As can be seen by the pics, light does indeed reach and illuminate the ground in the area of entering and exiting the vehicle. 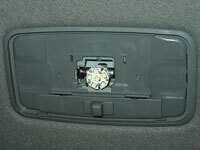 To install, I prefer to pop out the entire door light housing rather than just the lens. It just comes out easier then trying to get only the lens itself off. Once the housing is out of the door, the lens can be removed much easier. 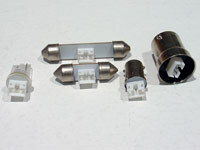 Nothing special here as there are not many variations at all to choose from when it comes to the vanity replacement bulb. This 3 SMT Led bulb appears to run at almost a quarter watt and the color matches all the other lights we are replacing as part of this project. Installation again is relatively simple. Just take your time removing the vanity light lens as the tabs holding it in place appear to be fragile in nature. Getting the lens out with a small screwdriver is simple, but putting it back in place is a little more worrisome. When trying to remove the factory bulb, be sure to remove the dome light fuse before using any type of metallic tool to pry it out. 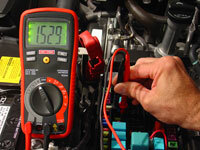 Otherwise you risk creating a short circuit and blowing the fuse at a minimum. 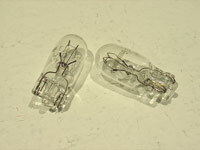 This #74 bulb, although small and often overlooked, has quite a few replacement choices. 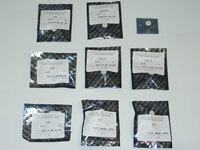 Again, high power SMT technology was desired. Currently this is not available in a 5,000k color rating. Looking at the factory bulb housing for this glove box light shows that a down firing only type of bulb would again be best. 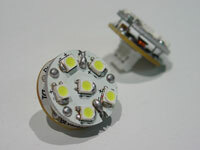 V-Leds half watt 74_HP_W #74 replacement Led appears to be best offering out there. Installation is quite tricky, but once you find the release tab and pry it open with a small screwdriver, the light housing will drop down. 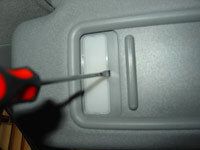 Then, as with the vanity bulbs, it is difficult to get your fingers in there to pull out the bulb. Using a piece of electrical tape, sticky side towards the bulb, to assist with getting some grip on it appears to help quite a bit in removal efforts. 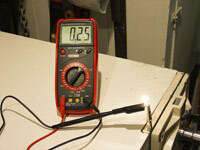 This Led light itself is very bright, more so than I thought it would be. 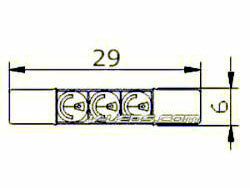 The limiting factor with useful light output is the factory design and location of the light housing itself. With the upper storage box in the open position, and all the owners manuals and such in this upper compartment, little if any light can make it's way to the lower and much larger main storage area. In the future and as time permits, I will have to add additional Led lights and the wiring that will be required to make them work, to this main glove box compartment. 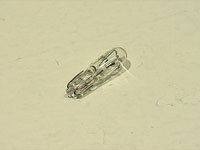 One should note that this bulb is not part of the dome light circuit. 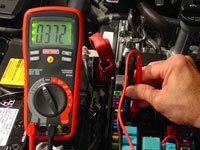 It is part of the Taillight and Illumination circuit. 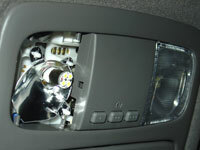 To operate this light, the glove box needs to be open and the headlamp switch needs to be in any on position (parking,low,high). 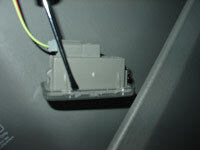 Yes the 2006+ 4Runners have a glove box door operated light switch. The 2003 and 2004 models do not, not sure about 2005. 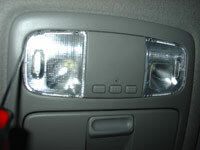 So anytime your 03-04 parking headlights are on so is the glove box light. The 2 dome lights, 2 map lights, 4 door lights and 2 vanity lights I changed over to Leds are all on the dome light circuit. 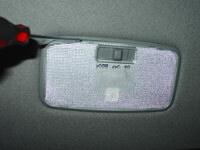 So is the ignition key cylinder light, but that is already a Led type light as equipped from the factory. 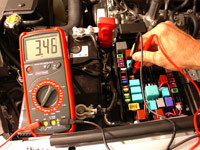 For Limited model owners, the running board (step) lights are on this circuit too. 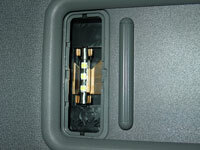 The glove box light, which I changed to Led as well, is not on this circuit, it is on the Taillight and Illumination circuit. I took measurements of the dome light circuit's current draw with the above mentioned lights (2 dome lights, 2 map lights, 4 door lights and 2 vanity lights) ON both before and after the conversion to Leds. As you can see in the pics below, the amperage draw with incandescent bulbs was 3.46 amps or 3,460 milliamps which equates to 43.3 watts. 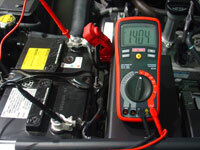 After converting to Leds, but before adding the footwell lights, the circuit was measured drawing only 1.529 amps or 1,529 milliamps which equates to 19.1 watts. 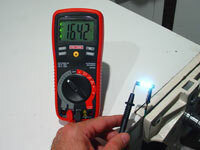 This is a significant savings and adding further Leds, such as the footwells, to this circuit will not be a problem at all. 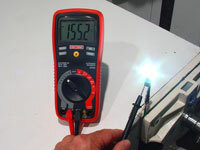 To measure the current draw of the dome light circuit, you need to hook up the multimeter in series with the circuit's wiring. 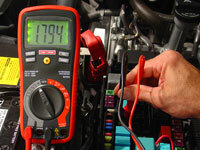 The easiest way to do this is to remove the dome light circuit's 10 amp fuse located in the engine compartment fuse box and connect your meters probes there instead.